Late March into mid-April is the Sakura season in Japan. Every year, within a two week window, the cherry blossoms start to bloom turning Japan into a sea of pink. It marks the true start to spring. If you plan your trip to coincide with this season, you will not be disappointed. You’ll be able to experience a unique Japan that very few tourists will ever experience. Many people wonder what is so special about the cherry blossoms. It isn’t, necessarily, only the fact that they are beautiful, but also some of the history of the cherry blossoms with Japan. It has been part of their culture for centuries, if not millenia. There is a fairy tale saying that there is a body buried underneath each cherry tree. 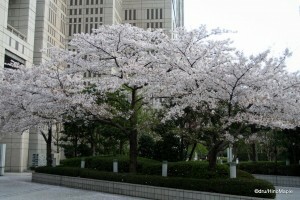 Cherry trees are the only trees in Japan that have flowers that bloom before leaves are grown. While I cannot verify this claim, it does help promote the tale. This also brings a feeling that cherry trees are somewhat magical and it can bring about powers to many people. It is very common to see cherry trees planted within temple grounds, parks, along rivers, and almost everywhere else a tree can be planted. The most popular thing to do in Japan during the sakura season is to go to a hanami. 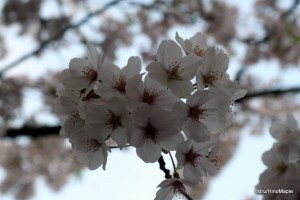 In fact, many Japanese people don’t say “sakura season” but rather “hanami season”. Literally translated, this means flower watching season, or more specifically watching the cherry blossoms. On weekends, it’s common to see families enjoying a nice stroll in the park or along the river enjoying the beautiful cherry trees. You can see many friends playing Frisbee or just having a nice time talking to one another. It’s a great time to have a picnic. These usually involve bentos (Japanese style packed lunches) and onigiri (rice balls with some type of filling and seaweed wrapped around it). When the sun goes down, things can change dramatically. Often, there are many floodlights that are turned on to make the pink blossoms stand out even more. It can create very surreal experience. It is also when all of the office workers come out to party. Hanami parties are very common for offices and friends. 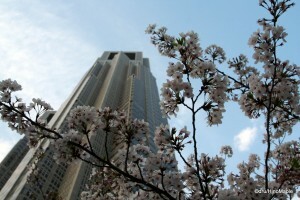 For the two weeks that the cherry blossoms are blooming, almost every office in Japan will have their own hanami party. While this is probably declining in recent years, it’s still a popular tradition among the older companies. Being the end of the fiscal year for most companies, and the start for most new recruits, it’s the final menial task for new recruits who are about to enter their second year with a company. They have one, and only one mission. Find a nice spot in a park, a park that has been decided by the office, and start camping out there from the mid-afternoon. The spaces under the cherry trees, themselves, are often taken by noon, and some workers must camp out there all day. It’s a long and boring task that essentially involves unfurling a large blue tarp, making sure it’s secure, and then sleeping all day. They can also play games on their phone or whatever electronics they have. Once their co-workers finish for the day, they can start to party. Generally, it’s a loud, crowded, and jovial event. If you are weary of such crowds, it’s best to avoid the parks at night, but there are a few places you can visit that are still nice, and not too bad. In Tokyo, there are several great places to visit. 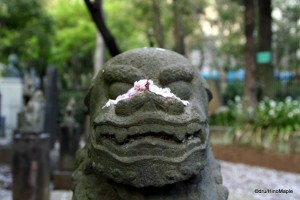 Ueno Park is one of the most famous places in the north. The entire park is lined with cherry blossoms, but unfortunately, the entire park is paved, so there is very few, if any, grassy areas to sit, eat, and enjoy the cherry blossoms. It’s also one of the most crowded areas in this season. Another area is Kudanshita. It is an area north of the Imperial Palace. There are many areas here that can be enjoyed, along with almost any other place around the Imperial Palace. Yasukuni Shrine is another famous, if not controversial, place to visit. 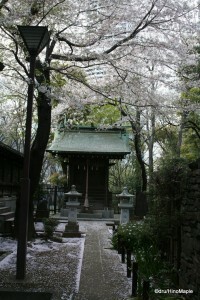 There are many cherry trees within the shrine and along the streets surrounding this shrine. It’s a beautiful place. Shinjuku Gyoen is also highly recommended, as is Shiba Park at the foot of Tokyo Tower. The Sumida River and Meguro River is also famous and worth a visit if you have the time; and you aren’t tired of looking at cherry blossoms. If you need to get out of Tokyo, Kyoto is always highly recommended. The cherry blossoms are always nice, but I have not had the chance to see them. I would also recommend visiting Himeji. It becomes more beautiful with all the pink blossoms providing a new look to the castle. It’s somewhat rare to see the white castle framed with cherry blossoms. The park in front of the castle is also very nice and extremely popular for locals to enjoy the weekend. If you get a chance, I’d also highly recommend visiting Himeji during this season as well. The cherry blossom season is a beautiful time to visit. Just remember that you have to be very lucky to get your timing right. Pick a few weeks to visit and cross your fingers. This entry was posted in Sakura (Cherry Blossoms) and tagged Blossom, cherry, Cherry Blossom, Cherry Blossom season, Cherry blossoms, fairy tales, Gyoen, hanami, hanami party, hanami season, Himeji, Himeji Castle, Himeji-jo, Hyogo, Imperial Palace, japan, japanese office party, Kudanshita, Meguro River, park, party, Sakura, sakura season, Shiba, Shiba Park, Shinjuku, Shinjuku Gyoen, Spring, Sumida River, tokyo, Tokyo Tower, Tokyo-to, Ueno, Ueno Park, Yasukuni, Yasukuni Shrine by Dru. Bookmark the permalink.